Have you ever been rescued before? What did that feel like? At some point in your life, you will very likely be asked if you are saved and how you know that you are saved. How would you respond to that question? Catholics would say that we were saved by Christ on the cross. We cannot simply say that Jesus saved us on the cross and then live according to the same old sinful patterns in life. We must make every effort to change our lives and live according to Jesus’ example. It is because of Jesus’ love for us to the very end that he ultimately gave his sacrifice redeeming value. It is because of Jesus’ love for us to the end that his death atoned and made satisfaction for our sins. It is the life he led and gave us that is salvific. We are called to live like Jesus and give our life in his service too. It is not Jesus’ death alone that is the means of rescue or redemption; rather, it is Jesus’ WHOLE LIFE, offered up selflessly and sacrificially in service for the good of others, even unto death. St. Thomas Aquinas explains this by telling us that satisfaction comes about when the maker of satisfaction (Jesus) offers to the one offended (God) something that delights him more than his hatred of the offense. Jesus’ self-sacrificing love and obedience, the worthiness of his life (he was, after all, both God and a human being), the utter horror of his passion and the sorrow it caused him outweighed the malice of sin. The satisfaction that Jesus offered on the cross is greater than the offense committed by humanity. God not only causes salvation, God is salvation. God is perfect fulfillment and happiness. True salvation means we are completely fulfilled and know true peace and salvation. We have a God of “pathos”, a divine care for the world. Our God of pathos feels intensely: loves, cares, is glad, gets angry over injustice, urges, prods, forgives, is disappointed, gets frustrated, suffers righteous indignation, weeps, grieves, promises, pours out mercy, rejoices, consoles, wipes away tears and loves some more. It is selfless love. Jesus is a man for others, having only his love. This leads him to die powerless on the cross, with no armies, no magic tricks to save him. It is a creative, noncompelling, life-giving good. In raising Jesus from the dead, God instills hope for all, for everything, even the dead. It is call to solidarity. We can know God’s love only when we become a part of it ourselves. We can know the God of compassion only in committed resistance to every form of unjust suffering inflicted on others. Have you ever thought about what makes our faith special? What are your beliefs about the implications of Jesus’ resurrection? What sacrifices have you made? Did the good outweigh the loss? What did love have to do with it? When you venerate the cross on Good Friday, what will you hold in your heart? If others could only watch how you spend your time, how you spend your money, what you love, who you love, do you think they would see that Jesus has risen from the dead? What is something you can do TODAY to be more like Jesus? Instead of commentary on all the readings for this Palm Sunday, here is an opportunity to reflect on portions of the Gospel and 2nd reading as they pertain to Eucharist. You are present in the mystery of your Cross embodied in the Eucharist. Bring all peoples into communion with your redeeming love. You offer the world new life in the waters of baptism. Be present to those who are preparing for baptism. You strengthen the Church in the power of the Holy Spirit. Inspire with fervor those who are preparing for confirmation. You anoint in your likeness new servants of the Gospel. Renew in love all those who are ordained to the diaconate, priesthood and episcopacy. You unite in love those whom you have called to mirror your love for the Church in marriage. Fortify the bonds of love that bind all married couples. You reconcile to God all those who have gone astray in sin. Cleanse and heal those who desire to return to you. 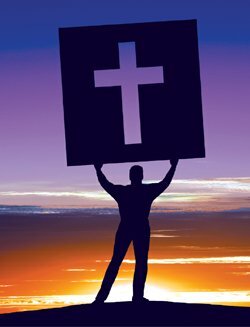 You strengthen all those who are called to adhere to your Cross in sickness. Comfort the sick and those who care for them. You give yourself as food for the journey to all those who face the passage from death to life. Enlighten the dying. O Lord, gather us in holiness around the table of the Cross, that together we may proclaim your saving love to all the world in word and in work, through Christ our Lord. Amen. 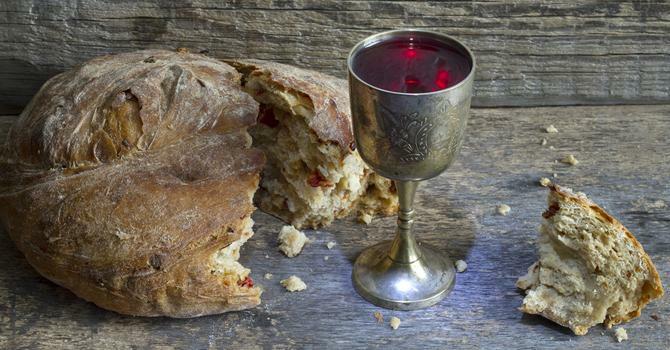 What do I remember about my initial experiences of the eucharist? How have those experiences influenced the significance I give to the eucharist in my adult life? How does being part of a community of believers help me to make the continued act of faith which the eucharist requires? What have reverent moments of receiving the eucharist taught me about intimacy? Have I made the connections between eucharist and service which are shown by Jesus at the Last Supper? Do I experience the eucharist as strengthening me to serve as Jesus did? In what ways am I bread that is broken and shared with others on a daily basis? “Throughout the week we can feel and express our gratitude. We can experience, in the midst of very hectic and messy times, a peace the world cannot give. All week – whether we are driving or walking from one place to another, or pouring a cup of coffee, or simply pausing to catch our breath – we can hear him say, ‘I have given you an example; do this in memory of me.’ He is broken and poured out, to completely give himself to our very human struggle that we might be whole and ourselves become bread for our world, “ (Retreat in the Real World, p. 243). that we may ponder its meaning. that we may listen attentively to God’s Word. that we may see God’s love in this world and in those around us. to the mysteries of God’s goodness and other’s needs. that we may speak God’s love and mercy in our words. with the love and wisdom of Jesus. I cannot remember if I ever mentioned it to you, but I was in the Holy Land in January. One place I have not talked about though is a lovely church about half way down the Mount of Olives in Jerusalem called Dominus Flevit, or “The Lord Wept.” It commemorates the spot of Jesus’ famous lament for the city. “Jerusalem, Jerusalem, you who kill the prophets and stone those sent to you, how many times I yearned to gather your children together, as a hen gathers her young under her wings.” And the remarkable thing about that spot is that if you extend your arms like a hen would spread her wings to gather her young, from that perspective, your arms would encompass the entire walled city of Jerusalem. Theologians have a lot to say about this passage of scripture because of the language around a new covenant. What was wrong with the old one? How is this fulfilled? What does this say about how God works in our lives? Are we puppets to God’s law? What does this say about church hierarchy? “You shall be my people and I will be your God,” is similar to the marriage contract of that time period. It was found on papyri, “She is my wife and I am her husband this day and forever.” It is a solemn agreement. A sacred bond. But the Israelites broke that bond with God. So the Lord, through Jeremiah, is proposing a new covenant that will be written in our hearts rather than on stone tablets. Instead of external instruction this covenant will contain an interior principle of personal regeneration; hence charismatic leaders such as prophets and priests, who instruct the people in the obligations of the law of Yahweh, will not be necessary in the new covenant (McKensie’s Dictionary of the Bible, p. 155-156). For Yahweh’s law to lodge in the heart of the people is for the people to obey Yahweh not out of obligation at all but out of their glad free will. Jesus is our example. Jesus obeyed God not simply because he was obligated to, certainly not because he was forced to, but more profoundly because he wanted to, (Holladay’s Long Ago God Spoke, p. 33-38). So we are not puppets. Maybe there is no plan. God has planted goodness in us. It is up to us to live it. But let’s be careful not to read Jeremiah’s prophecy as meaning Jesus is the new covenant, as that would displace Judaism. For Jeremiah, the new covenant is with the house of Israel and the house of Judah. In the end, Jeremiah is unclear about the future…Jeremiah ends up being killed by his own people. What IS clear is that God will always prevail when all other forms of rule are exhausted. Because of this, the future is open and awaits embrace, (Brueggermann’s Introduction to the Old Testament, p. 189-190). All religion must ‘deal with’ suffering and give it meaning and hope. All religion is about this question: what are we to do with our pain? In and with Jesus we can face the reality of pain, suffering, rejection – even death – and then let this reality transform us. This is the ‘Paschal Mystery’ of Jesus’ – the dying and rising that is a part of our lives. If we do not transform pain, we will transmit it. The image of a seed is a good one. The seed when it ‘dies’ is not annihilated, It simply ceases to exist as it did in order to become something else, something fuller, richer, more vibrant, brimming with life. This theme of death in Christianity is never to be morbid. It is never dying or suffering for its own sake. It is not about being discarded or worthless or lost. We are born to love, to be outgoing, self-giving. It is only our fear and self-centeredness that needs to die. When we let go, ‘die’ to that, we find life brimming with goodness. When we give up being self-centered, clutching things, we open up to everyone, to life. It is a question of becoming what we were made to be. The seed is made to blossom and grow and bear fruit. So are we. Jesus reveals to us what God is like. God sent Jesus to be one with the human race – to save humanity and to show the world definitively and forever just how much he loves them. Humans would never have believed God’s love had God not sent Jesus. And, Jesus was true to his mission. He stood with the poor and with sinners. He was courageous, challenging all who refuse to love and to serve. Jesus’ torture and death was a crime. It was murder. He was an innocent man. Jesus himself renounced it as a sin, an evil. Jesus’ death was a result of sin, hatred, prejudice, animosities, jealousies, fear, pride, power. Yet, in his death he expressed the highest form of human love. This is what was pleasing to God: Jesus’ inner disposition of faithfulness and love and his willingness to die for his people. This is what God willed: love so deep that he was willing to sacrifice his own life for it. In this way Jesus was able to reveal the love that God has for all of us – a love that is willing to go to any length, even humiliating lengths, — even to death, itself. From Carrie Newcomer, singer and poet: Transformation is deeper than “the only way out is through”. At the growing edge…the only way through is in. That is where I begin to look at something I really don’t want to see, a place I do not want to go. It’s uncomfortable, and I have to sit in an uncomfortable place, process and uncover in what way this hard thing, the thing I did not want,has meaning for me. This is where I learn that this discomfort will not drown me, but transform me. And yes, eventually, a lightness arrives. It comes with a deep acceptance of my own humanness, a clearer view to what comes next. The paradox that sometimes to get where we need to go, we have to travel where we did not want to go. Along with Ezra and Nehemiah, 1 and 2 Chronicles represent a type of ‘history’ of the people of Israel from their origins to the period of reconstruction AFTER the exile. The world had changed. The author exalts David even more than he is exalted in Kings 1 & 2; the exile was viewed more as the people’s failure to worship Yahweh. But in today’s reading, we hear God hating the sin but loves the sinner. God is always ready to forgive at the first sign of a repentant heart, (M. Birmingham’s W&W Wkbk for Yr B, p. 214). “Real forgiveness means looking steadily at the sin, the sin that is left over without any excuse, after all allowances have been made, and seeing it in all its horror, dirt, meanness and malice, and nevertheless being wholly reconciled to the person who has done it. That, and only that, is forgiveness,” (J.C. Arnold’s Why Forgive?, p. 44). The theology in this letter is in sharp contrast to the retributive-type justice we see in the first reading. How does this writer see God working in human history? To many Greeks philosophical systems and self-improvement ideas were seen as ways to great human capabilities. To them the ‘saving act’ was knowledge. The Christian writer who composed this letter is trying to emphasize that ‘salvation’ is God’s transforming gift to sinners. The writer was trying to stress that God’s great love (revealed and given freely to us in Jesus) is not a reward for good works or great knowledge. Yet, a life of good deeds is the natural outcome, (Celebration, March 2003). God is personal. God is not a by-itself, or an in-itself, or an in-and-of itself, but rather God exists in a communion of persons toward one another in self-giving Love, revealed in Word and Spirit in human life, in history, in the world. God is immutably toward us and for us in the self-giving Love that is constitutive of the divine life. All reality is personal. Everything that exists is from God, in God, for God, who is God precisely in the relations of interpersonal self-giving Love: Father, Son, Spirit, (M. Downey’s Altogether Gift, p. 62). The Gospel ends in a strange way. Jesus “did not need anyone to testify about human nature. He himself understood it well.” He gets us. He knows that we love the show, the easy way. You see Jesus has an interesting frustration. It is not that he is failing. People are flocking to him. But they are coming for the wrong reason. They are coming because of the great and powerful deeds known as signs in John’s gospel. And what is wrong with that? Isn’t that what athletes want? Isn’t that what performers want? Homilists? But it isn’t what Jesus wants.